It’s that time of year again, with the ghosts amount, and the zombies start dancing. Halloween is our favorite day of the year, and what a better way to celebrate this holiday season then with a custom-made 3D printed jack-o’-lantern—all within Photoshop CC 2014. Okay, put away the knife and let’s begin! 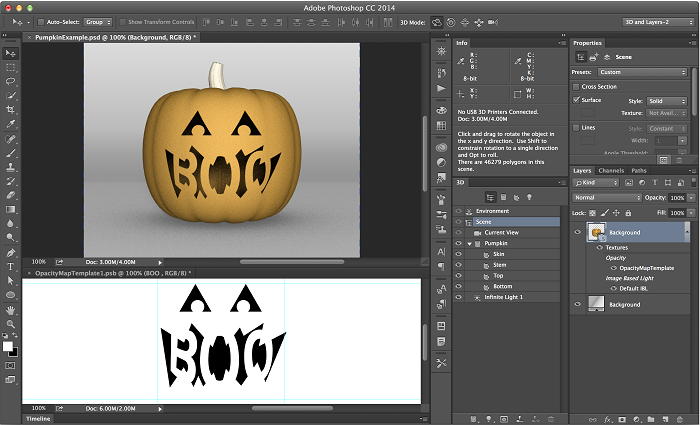 First open the Photoshop pumpkin file (Pumpkin.PSD). Note: If you weren’t presented with an option to change the 3D workspace, or aren’t in the 3D workspace, I would suggest you switch to it now by clicking on the workspace drop-down menu in the upper right hand corner, and selecting 3D. Tip: If your windows and panels are laid out though you like them, save off workspace so that you can come back to it when you’re done, or whenever you’d like. In the Layers panel, click on the layer named Pumpkin Scene, and you should see the pumpkin sitting in the 3D panel. Tip: You can double-click on the Layer Thumbnail to open the 3D panel. In the 3D panel you’ll see the basic scene elements, like Environment, Scene, Current View (camera), and an Infinite Light, as well as a the Pumpkin mesh that has four (4) Materials attached to it: Skin, Stem, Top, and Bottom. Click on the material layer named Skin. You’ll see the material properties in the Properties panel. Shows us all of the colors and textures being used for the currently selected material. The Diffuse Color set the color of the pumpkin. And there is no texture map loaded for the fuse (the folder icon to the right). Click on the Color Picker to change the color of your pumpkin. Note: Unless printing in full-color sandstone (via Shapeways), your model will print in the color of the material being used by the 3D printer. Now, look at Opacity, you’ll notice to the right field that the icon is different than the folder icons above; that’s because there is a texture map (image/Photoshop file) loaded. This is how you’ll be “carving” the pumpkin. Note: When the “opacity” document opens you’ll see three layers in the Layers panel (Boo, Face, and Background), and the Properties panel is now showing 3D Paint. You’ll also notice that the face is black on white; this is because for Opacity texture maps white is solid, and black is completely transparent. Tip: You can hide the “Boo” layer, save the file, and switch back to the Pumpkin document to see the changes. The mouth is now open and the words Boo are gone. There are two ways you can carve your pumpkin’s face: with the vector tools (in the Opacity texture map file), or painting on the texture map in the Opacity Texture map file or directly on the Pumpkin model directly. Before we begin, let’s hide the two layers Boo and Face in the opacity map and make a new layer to work on. Carving with shapes when 3D printing gives me a nice hard edge, and you can use all of the vector tools in Photoshop, such as the Shape and Path tools. Simply select the Shape tool, set the Fill Color to black and Stroke Color to None, and draw the shapes you want the face to have. Note: Keep the face elements near the previous elements, and within the guides for best alignment. Tip: Save the changes (opacity texture) and switch back to the Pumpkin file to see your results in real-time. Alternately you can select the Pen tool and draw a custom shaped, making sure that it’s a close path. Tip: Click on the starting point of the path when you’re done drawing the shape to close it. You can use as many layers as you want as the Texture properties are using a composite of the (black and white opacity texture) image, and not just any one layer. Tip: Make folders with various faces and Show/Hide them before saving and switching to make various faces with just the one texture map. You can also “carve” the face using a brush, just remember that you need to have a black and white image, and that shades of gray, or a feathered brush can pose problems and have unexpected results. Simply make hide the Boo and Face layers in the Opacity texture map, make a new layer and paint in black. That’s it. Simple! Tip: Make sure your Brush tool options are set to Hardness: 100%, Mode: Normal, Opacity: 100%, and Flow: 100%. Also, you can Save and switch back to the Pumpkin file to see your changes as you make them. When you finish carving pumpkin and have saved and closed your Opacity texture map, switch back to the Pumpkin file and select Scene from the 3D panel—this will show you the Scene properties in the Properties panel. Select the 3D Print Settings attributes (second icon, similar to a printer, at the top of the Properties panel), to show the 3D Print Settings properties. If you have a local 3D printer then select Print To: Local and select your printer from the Printer: list. You can also select Printer: Export STL and save the file to a CF card to print directly on a 3D Printer. In addition to printing locally, you can also use one of Adobe’s partner services to print your pumpkin. Just change Print To: and select Sculpteo or Shapeways, select the Material you’d like to use and that’s it. Tip: You can select “Estimate Price” at the end of the material list to show estimated print price for the object to be printed in the material selected. You can now adjust a few other properties, such as the Detail Level (higher level provides greater resolution/details), and change the size of the pumpkin to be printed. The last and final thing that you need to have is the Surface Detail enabled (checked) and Opacity enabled (checked). This will “carve” the face out of the pumpkin model when prepping the file to print. Note: You don’t need Normals or Bump maps unless you are using them to provide additional surface detail to the pumpkin. Next, at the bottom of the Properties panel, with the 3D Print Settings still showing, you’ll see two icons, Start Print (left) and 3D Printer Utilities (right)—click on Start Print—this will prepare the pumpkin for printing. The 3D Print Dialog will appear when it’s ready to print or export. If you’re using a local printer you can print directly from Photoshop by selecting Print. If you’re using a 3D Printing Service partner (Sculpteo, Shapeways) you’ll save the file and then upload it to your preferred service provider. That’s it! 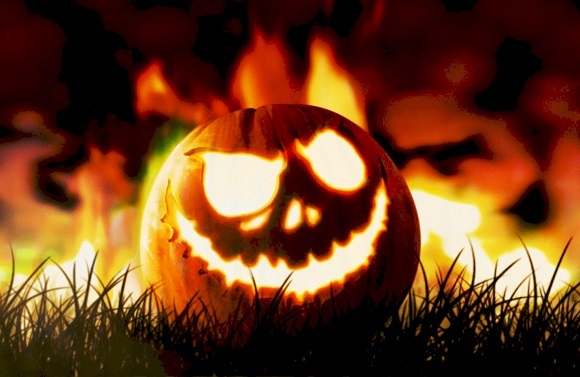 Good luck and have fun carving your pumpkins!